Money is not everything and we must obviously not judge others, or even ourselves, by the level of financial success. However, there is no denying that money is important. But before we can attain the highest level of success we are capable of, there are several stumbling blocks that stand in the way that we must deal with. The first of these stumbling blocks is low income. Money could come from one’s earned income or investments. Since you are unlikely to have many investments if you do not have a good income, the best way to avoid this killer of dreams is to work towards increasing your income. High-income earners include skilled professionals, successful artists and entrepreneurs. Competition to succeed in these arenas is cutthroat. Only those who are willing to dedicate their life to their career are likely to rise to high income status. Working, studying and networking occupies a huge portion of the waking hours of high earners. Perpetual personal development is the price to be paid in exchange for a high paying occupation. Some careers pay notoriously low incomes but are enriching to the right person in terms of personal satisfaction and sense of fulfilment. They are more of a calling than a job. If you are in such a career and you find it fulfilling, you may want to consider starting a side hustle to provide you with the additional income you need. If your current occupation does not pay well and is not fulfilling, try and project your progress into the future and see if it holds any hope of improvement. If it doesn’t, change to something that gives you a better all round life. Never stick to a job you hate because it offers job security. Job security, as many have found out is an illusion. The most secure person is the one with appropriate personal attributes and up-to-date marketable skills. 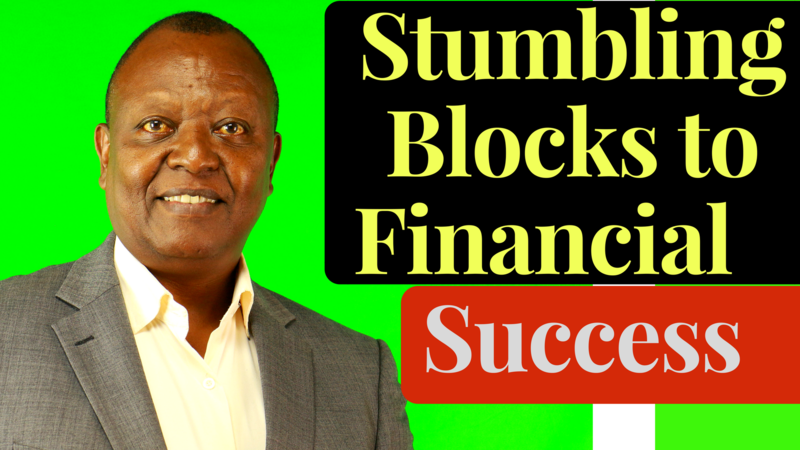 You may have a reasonable income, controlled expenditure and still fail to achieve financial success because you have not overcome the third stumbling block – lack of a plan. A plan implies that you know your financial position, you have quantified and realistic financial goals and a practical plan that enables you to achieve them. Without a plan, you are, like most people, floating down the river like dead fish, at the mercy of life’s unpredictable currents. It is said that the uncertainty of life is life’s only certainty. And there lies another stumbling block to financial success – the vagaries of fate. An illness, death, material loss through theft, a legal suit – any of these can result in devastating financial setbacks. These eventualities can make you feel like Sisyphus, a character in Greek mythology. Sisyphus was condemned to push a huge rock up to the top of a mountain only for it to roll all the way down to the bottom; he would then have to start all over again and again till eternity. Risk can turn you into a modern day Sisyphus – working hard for years only to lose everything and start all over again. Put in place insurance and wills to keep this cruel killer of dreams at bay, or all you life’s work could be in vain. Working at cross purposes with your spouse is another stumbling block. It is said that when two people work together in harmony, they achieve more than if they worked separately. This synergistic effect can be very clearly seen in married couples’ affairs. If they work harmoniously together, they achieve very good results for the family. On the other hand, if they do not have common goals and a harmonised plan to achieve them, they work at cross-purposes and the results could be a financial disaster of titanic proportions. Money issues are often at the core of many marital conflicts. Ideally, before you tie the knot, you should ensure that your money attitudes are compatible with those of your prospective mate and where they are not, a compromise can be arrived at. If you are not making financial progress, examine your situation to determine if any of these stumbling blocks are standing in your way. If they are, then do something about it. Do not do what most people do; blame everybody and everything for your predicament, as this will not change a thing. Take personal responsibility of your financial life and steer clear of the stumbling blocks that can kill your dreams. Thank you for staying with me. I look forward to seeing you next week!